Horses are highly attuned to nature and they love perfect balance. Horses’ respiratory systems are extremely sensitive and by using our products we can help you to provide a healthy comfortable environment for your horses to inhabit, thereby reducing factors that can cause stress. 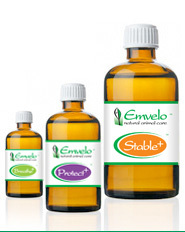 Emvelo’s range of products help empower you to allow your horses to freely develop their full physical potential in a natural balanced environment whilst reducing the need for chemicals, pesticides and drugs. Freedom from chemicals and pesticides can often make horses happier and far more responsive. Stable+is a spray which is applied to Stables, surroundings and bedding. Stable+ applied to the bedding and surrounds can help suppress any harmful micro-organisms that could cause diseases and the manure will dry quicker making it less odorous. 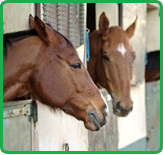 We also recommend applying to your horse transport system by creating familiar odours to the day to day living areas. Protect+ is a spray which is applied directly to affected parts of your horse, taking care not to spray directly into eyes. The aromatherapy oils and their associated odours create an environment that does not appeal to flies, fleas, tics, midges etc. The product can also be applied to horse rugs and halters.The different blend of aromatherapy oils work to deter flies and provide healing where already bitten. The micro-organisms within the product assist in balancing the bacteria in the skin thereby reducing possibility of infection. Breathe+ is a water-soluble respiratory spray comprising blend of the natural essential oils which provides symptomatic relief for breathing difficulties. Emvelo Breathe+ helps to liquefy thick sticky mucous and open up breathing passages. Breathe+ is applied using portable spray with a very fine mist within the stables morning and evening for about three days or as required. The product can also be applied neat to halters or rugs.